Minutes of meetings vary from meeting to meeting, however the content remains consistent. Minutes are the documented record of the discussions and decisions covered in the meeting. These should not be a verbatim account, but rather a summary of the discussion and decisions. If you are struggling with how to write minutes, the use of meeting software like MeetingBooster simplifies this process, improving consistency, accountability and overall effectiveness. There are three standard styles of minutes of meetings: action, discussion, and verbatim. Action minutes – includes only the decisions reached and the actions to be taken, not including the discussion involved in making the decisions. Discussion minutes – similar to the action minutes except that these include the discussions involved in making the decisions. Verbatim minutes - a word for word record of all discussions and decisions. The most popular type of minutes of meetings is Action minutes. Regardless of which style is chosen, it is important to include the start time, attendee’s present and any opening remarks. As the meeting progresses it is the note takers responsibility to capture all important discussions and decisions made during the meeting. The use of meeting software is becoming more popular, because it is difficult to accurately capture these topics. 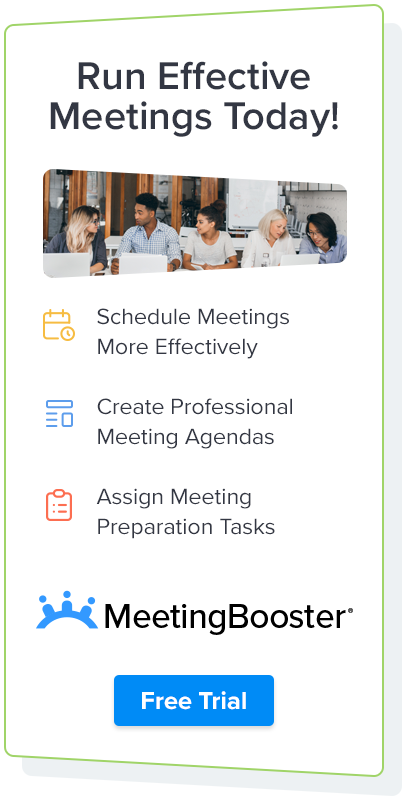 Meeting software such as MeetingBooster allows note takers to quickly enter notes based on a formalized agenda. Each topic can be selected, the corresponding attendee making a comment can be noted and any decisions made can be identified. It may be a good idea to review some of these types of tools if you are struggling with writing minutes of meetings. After the meeting, the note taker is responsible for reviewing and finalizing the minutes. Company letterhead, logos, color schemes and formatting are added to the document. This process is traditionally done using MS Word, and typically there is redundancy in that the note taker must re-type the captured information into a more formalized meeting minutes document. This document must also be easy to distribute and in some cases archived. When using meeting software like MeetingBooster, this process can be automated. Meeting minutes documents are created using professional layouts, capturing all important information and organizing it in an easy to review format. Users can distribute the minutes to attendees and teams with a few clicks and the documents are archived for future access and review.